Where Are The Dog Friendly Beaches? ...leave only paw prints. Please pick up after your pet on the dog friendly beaches. Cape Cod is an eco-sensitive area and you want to ensure you will be able to continue enjoying your vacation with your pet here for years to come. Dogs are allowed only during the off-season from September 15 to May 15. 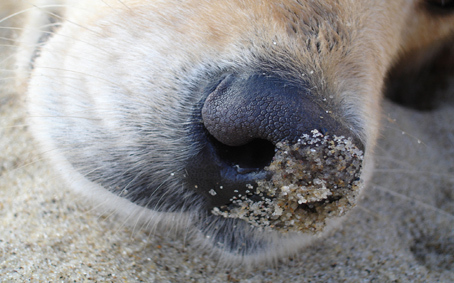 On these dog friendly beaches, your pet must be on a leash or under voice control. People need to clean up after their pets. The town of Barnstable oversees Hyannis beaches and the following beaches: Craigville, Kalmus, and Sandy Neck. Before you go, always verify the seasonal dates and times when dogs are allowed on the beach. Dogs are allowed on these dog friendly beaches only during the off-season from mid September to end the end of May. Dogs must be leashed. The town of Chatham oversees the following beaches: Hardings, Light, and Ridgevale. Before you go, always verify the seasonal dates and times when dogs are allowed on the beach. These are dog friendly from after Labor Day up to Memorial Day. There is one exception. 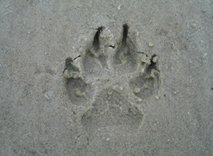 Dogs are allowed year-round on the four wheel drive area of Chapin Beach. Dogs must be leashed on all town beaches. The town of Dennis oversees the following beaches: Chapin, Mayflower, Howes Street and Sea Street. Before you go, always verify the seasonal dates and times when dogs are allowed on the beach. These are not pet friendly beaches during the summer from May 1 through October 1. During the off-season, dogs are allowed all day. Dogs must be leashed. The town of Falmouth oversees the following beaches: Menauhant, Surf Drive, and Old Silver. Before you go, always verify the seasonal dates and times when dogs are allowed on the beach. Dogs are allowed only during the off-season, from October to mid-May. Dogs must be on leash or under voice control. The town of Harwich oversees Red River Beach. Before you go, always verify the seasonal dates and times when dogs are allowed on the beach. Dogs are allowed only during the off-season, from after Columbus Day to the Friday before Memorial Day. Dogs are allowed off leash, but must be under voice control. The town of Orleans oversees Nauset and Skaket beaches. Before you go, always verify the seasonal dates and times when dogs are allowed on the beach. Rock Harbor is one of my all-time favourite dog friendly beaches. Here, the tide goes out for miles! At low tide, I bring my dog's "chuck-it" toy and she can run, and run, and run forever.... The sand is flat and hard and the waters are warmer here also. This "beach" is only accessible at low tide. Rock Harbor: At the Orleans/Rte 6 rotary, take the turn off onto Rock Harbor Road. Go to the end and you will arrive at a parking lot next to the docks/beach. There are really pretty Cape Cod style house all along Rock Harbor Road. Dogs are allowed only during the off-season, from October through March. Dogs must be leashed. The town of Sandwich oversees the following beaches: East Sandwich and Town Neck. Before you go, always verify the seasonal dates and times when dogs are allowed on the beach. Dogs are allowed during the summer, only before 9am and after 6pm. This policy is in effect from about the third weekend in June through Labor Day. During the off-season, dogs are allowed all day. Dogs must be leashed. The town of Truro oversees the following beaches: Ballston, Corn Hill, Fisher, Great Hollow, Head of the Meadow, Longnook and Ryder. Before you go, always verify the seasonal dates and times when dogs are allowed on the beach. The park offers a 40 mile stretch of pristine sandy beaches. Dogs on leash are allowed year-round on all of the seashore beaches, except for seasonally posted nesting or lifeguarded beaches. Leashed pets are also allowed on fire roads, and the Head of the Meadow bicycle trail in Truro. Check with the visitor center or rangers for details about fire road locations. To get there from Boston, take Route 3 south to the Sagamore Bridge. Take Route 6 east towards Eastham. 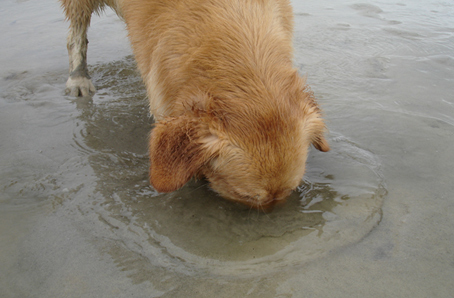 On these dog friendly beaches, pets are allowed during the summer, only before 9am and after 6pm. During the off-season, from after Labor Day to the end of June, dogs are allowed all day. Dogs must be leashed. The town of Wellfleet oversees the following beaches: Marconi, Cahoon Hollow, and White Crest. Before you go, always verify the seasonal dates and times when dogs are allowed on the beach.